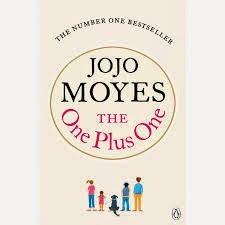 a book chick: "The One Plus One"
my take: Having loved Me Before You, I was eager to read another Jo Jo Moyes novel. Daughter Anne read one of hers that was historical fiction but I've read way too many WWI and WWII stories of late and wasn't interested in that one ... I spotted this whilst in the UK and after a quick perusal of the back cover, decided it was not historical and grabbed it. While not great literature, this is a great story. Her characters are a bit like Anne Tyler's (love and adore her) and her descriptions are easy to visualize ... I can almost see the movie version as I'm reading. There's an epic road trip that would make for very funny scenes. Fun, quick, quirky, feel good ~ would be a great vacation/beach read or a great middle-of-the-winter pick-me-up (to get through February or March). Interesting how different the cover is from the US version! And I think it's just called "One Plus One" here... finally got my library copy just the other day and am looking forward to it as I've found both other Jojo Moyes ones I've tried to be great reads (if not amazing literature).